From grand centrepieces to adorable nods to the Year Of The Dog, these creative confections are reason enough to indulge in this year's artful alternatives. This 28cm-tall centrepiece looks too pretty to eat, but it would be hard to resist knowing what it is made with. The base, which is shaped like an ingot, hides a luscious vanilla pound cake, while the curvy branches resembling a bonsai tree is really chocolate covered with the same golden yellow fondant icing. Call 6730 1786, email deli@goodwoodparkhotel.com or visit the shop at lobby level, Goodwood Park Hotel for orders. Chef Leong Chee Yeng is a culinary genius with a passion for the visual arts, too. His intricate centrepieces (which are displayed at Jade) aside, his pineapple tarts this Year Of The Dog is shaped like adorable bull terriers. And they taste amazing—the buttery pastry gives way to an indulgent and jammy pineapple filling made with locally harvested pineapples. Comes in a box of nine pieces. Call 6877 8943, email fullertonshop@fullertonhotels.com or visit the shop at lobby level, The Fullerton Hotel Singapore for orders. Trust chef Pang Kok Keong to create a sweet version of the ubiquitous yu sheng. His creation is presented in a golden chocolate egg shell filled with auspicious treats such as chocolate fish, golden chocolate ingots and coins, five-spiced almonds, mandarin orange butter cake, meringue kisses, and yam and sweet potato chips. Crack it open with a hammer, sprinkle with mandarin orange segments and drizzle with a concoction of plum gula and melaka dressing for a sweet start to the year. Call 6836 9527 (Mandarin Gallery) or 6293 3121 (Penh’s Road) or visit the shops at 30 Penhas Road or 02-33/34 Mandarin Gallery for orders. There's more to its appeal than its eye-catching bright orange appearance. Inside is a moist almond sponge topped with mandarin orange jelly for a citrus twist, then held together by layers of rich white chocolate mousse and orange chocolate cremeux. Call 6688 8588, email SweetSpot@MarinaBaySands.com or visit the shop at Marina Bay Sands for orders. 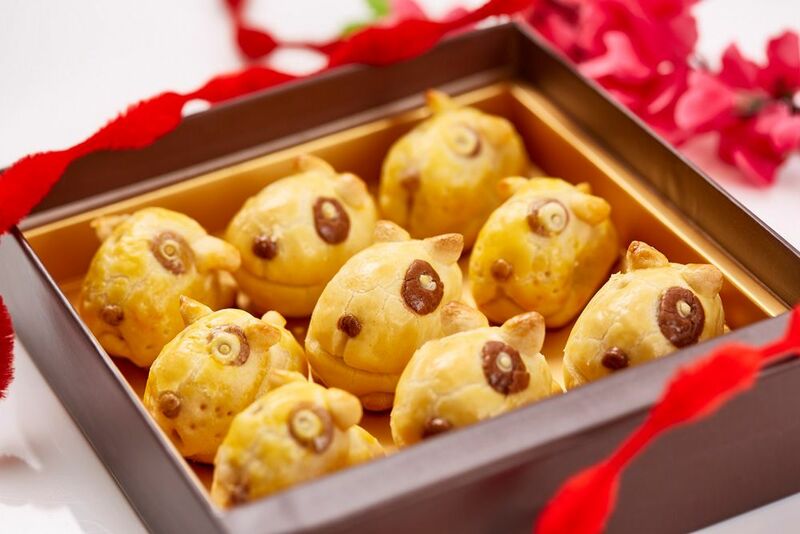 This popular Japanese confectioner offers its signature cigar-shaped butter cookies in a limited-edition CNY gift box, which features the Shiba Inu (a native dog breed in Japan) on the cover. One box gives you eight pieces each of Cigare, the original flavour, billet au chocolat au lait, a combination of vanilla and chocolate, and billet aux amandes chocolat, which has a milk chocolate base and almond topping. Visit the store at 03-K1, ION Orchard for orders. This gorgeous looking limited edition treat is the restaurant's signature pandan chiffon cake in its latest guise, topped with a zesty orange and white chocolate mousse, then covered in a vibrant red glaze. It's made more indulgent with a generous dusting of edible gold. Call 6408 1241 or visit the shop at Andaz Singapore, level 2, for orders.